DETROIT — Last season, the Detroit Pistons acquired Blake Griffin in a blockbuster deal shortly before the trade deadline. So far, their moves this time around have been a lot more mild. The Pistons traded Reggie Bullock to the Los Angeles Lakers on Wednesday for rookie guard Svi Mykhailiuk and a future second-round draft pick. 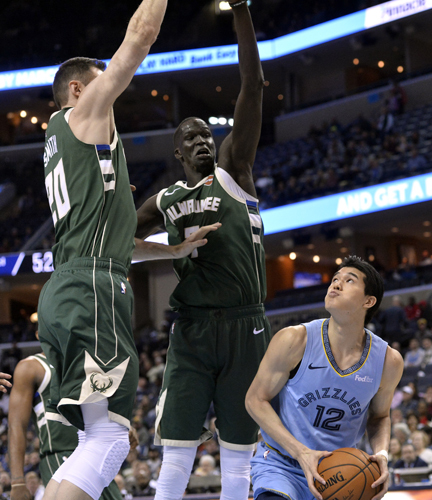 Detroit also agreed to send forward Stanley Johnson to Milwaukee for center Thon Maker, according to a person familiar with the situation. The person spoke on condition of anonymity because that deal had not been announced publicly. The Pistons have been mediocre for a while, stuck between contending and rebuilding. For that reason, almost anything seemed possible as Thursday’s trade deadline approached. Last year, Griffin came to Detroit in the middle of the season, but that wasn’t enough to put the Pistons in the playoffs, and the franchise eventually parted with Stan Van Gundy, its coach and team president. This season hasn’t been much different under new coach Dwane Casey. Detroit is 24-29. Griffin and Andre Drummond are both productive, but that hasn’t translated to much team success. The trade with the Lakers appears to have been made with the future in mind. Bullock played his way into a starting role with the Pistons over the past two seasons. He is a career 39.8-percent shooter from 3-point range. Mykhailiuk was a second-round pick by the Lakers out of Kansas, and the Ukrainian impressed the team enough to earn a regular role on the NBA roster. But he has averaged only 3.2 points in 39 games. Johnson and Maker are recent lottery picks who have struggled to make a consistent impact. Now, they both get a change of scenery. The Pistons took Johnson with the No. 8 pick in the 2015 draft.